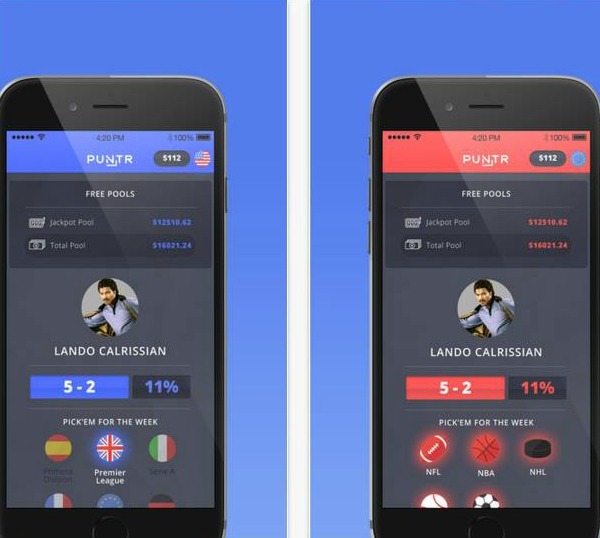 Are you looking for a smart new sport betting app? Well when it comes to safe betting, there really is only one option for you. And that option is Puntr. It is an amazingly designed app that lets users bet on many different types of sports league for free. The app has a slick and minimalistic design. Thanks to its interface, you get all the information you need without getting a headache. Unlike other betting apps, this app holds tons of cool features for you. The Puntr app gives its users the option to enter as many tickets as they like, for free! You can choose between both American and European sports and leagues. Some of the sports currently available for betting are: American Football, European Football, Ice Hockey, Baseball, Basketball and much more. The way you enter tickets is very simple. All you have to do is pick your sport or league, select the team that you predict is going to win (or select a draw if you predict so), and then just sit back and enjoy the show. You can also check out your pick ratio to see how many times you were right or wrong with your predictions. Also, there are free prize pools with free money you can win with select corrections if you decide to opt in for ads. Just open the official website and you will see that the jackpot prize is 50,000$ minimum guaranteed and that League specific prizes range 80-300$ on average. You get this all for free, just watch the advideo or fill the required survey. This app has tons of other great options for the dedicated sports junkie. If you’re interested about Puntr, you can find and download it for free directly from the App Store.